JOHANNESBURG – (AFP) – The cheetah, the world’s fastest land animal, survived mass extinction during the last ice age 10,000 years ago. But it has taken just the last few decades for man to place the hunter on the endangered species list, with experts warning it could disappear from the wild by 2030. Unlike rhinos and elephants, the cheetah is not a target in Africa’s poaching bloodbath. But it is the only big cat to adapt poorly in wildlife reserves as its natural habitat is increasingly wiped out. 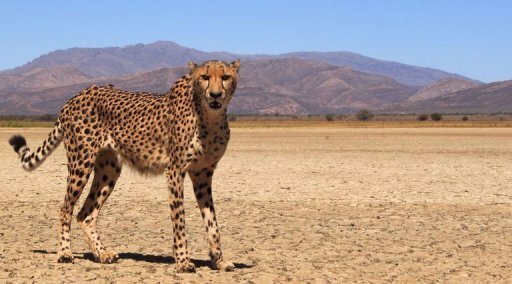 “Cheetahs don’t do well in protected wildlife reserves due to increased competition from other larger predators, such as lions and hyenas, which thrive in protected areas,” Laurie Marker of the Cheetah Conservation Fund in Namibia told AFP. “Most protected areas are unable to maintain viable cheetah populations,” she added. In the early 20th century, the global cheetah population was around 100,000 with populations throughout Africa, the Middle East and several Asian countries. There are barely 10,000 in the wild today, in Africa, and a small population in Iran which is critically endangered. According to big cat NGO Panthera, cheetahs have disappeared from 77 percent of their original territory in Africa. The International Union of the Conservation of Nature lists the southern African species as vulnerable. “The main limitation to the survival of the species in the wild is reduction and fragmentation of habitat as well as human wildlife conflict,” said Marker. If no special measures are taken, wild cheetah will disappear by 2030, according to Panthera. The greyhound-like cat, with its distinctive tear-stain-like facial markings and spotted golden coat, is a consistent loser in confrontations with lions or leopards which are heavier and more powerful. Even in a good scenario, its prey will be stolen before it has a chance to feed. In the worst cases, the cheetah will be killed. The sprinter, which reaches speeds of up to 120 kilometres per hour (74 miles per hour) needs vast open spaces with a low density of fellow carnivores to thrive. In Africa, it is estimated that 90 percent of cheetahs live alongside humans where they are often in conflict with livestock farms. Another handicap it faces is natural inbreeding dating back to the last ice age when the global population plunged. As a result, according to the Cheetah Conservation Fund, every cheetah today is as closely related as if they were twins, leading to a genetic bottleneck. This puts the cheetah in an unenviable position. To enable the mixing of genes, they need a greater range than other animals to be able to freely migrate. But as humans increasingly encroach on its environment, this has become even more difficult. Researchers know that isolated micro-populations of threatened species lead to rapid extinction. So in the short-term, the easily tamed animal is being raised in captivity. Private farmers, notably in South Africa, exchange individuals to maintain a healthy population. A pioneer of this approach is the Ann van Dyk Cheetah Centre near Johannesburg, which has achieved 800 births since the 1970s. It’s an encouraging figure for the survival of the species. But what lies ahead for those in the wild? “Our research and experience shows that even wild cheetahs that have not had at least 18 months of life with a mother in their natural habitat have a difficult time being re-wilded,” said the Cheetah Conservation Fund’s Marker. Against these odds, some game farm owners are hoping for miracles. Damien Vergnaud is one of them. In the desert-like Karoo, a few hours from Cape Town, he owns the 10,000 hectare Inverdoorn private reserve. “We hope to soon release three cheetahs in a totally wild environment, with minimal human interaction,” he told AFP. The Cheetah Conservation Fund would like to see the cat’s range boosted — not by traditional means of snapping up large areas of land, but through corridors that allow them to move freely. “We’d like to see the cheetah’s range increasing, with populations linked with each other through corridors, and even see cheetahs reintroduced to former range countries, like India,” said Marker.